Here at Loom & Spindle, we’re proud omni-crafters! Passionately dabbling in all things fibre. Today we’re taking a look at our first knitted swatch for Cotton Fine. Specifically, a sampler of Caitlin Hunter’s popular Tegna pattern. We thought this light-weight summer style would be a good match for this sumptuous blend of Pima cotton and merino wool. We knit the swatch to explore the interaction between gauge, knit fabric and fibre and assess the suitability of the yarn for a knitted project featuring lacework. Below, we’ve included our notes on how we interpreted the pattern to become a swatch and our thoughts on the resulting fabric. 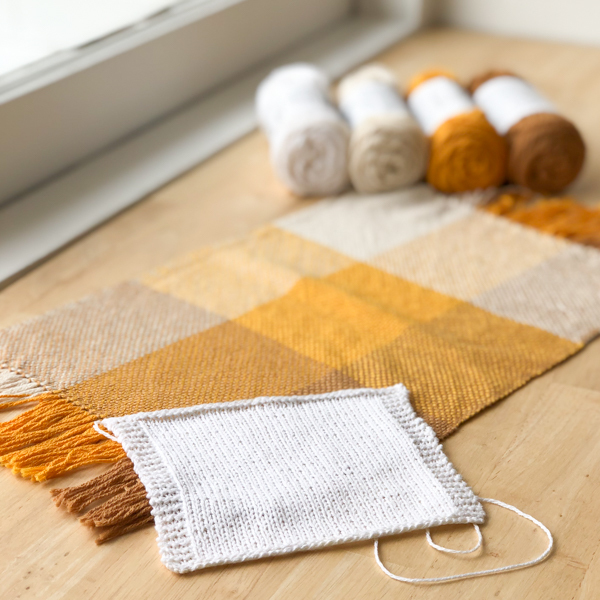 This ‘recipe’ is a great starting point if you want to have a go at swatching for your next knitting project. P.S. At the end we’ve detailed the yardage required for all sizes should you wish to knit your own! A knitted sample of Tegna by Caitlin Hunter, using Cotton Fine by Brown Sheep Co.
We focused on setting parameters for the piece and interpreting the pattern to accommodate the swatch. Working with the patterns suggested gauge of 22 stitches over 10cm (4'') in stocking stitch and the stitch count for the lace repeat, we decided three lace repeats would provide a reasonable sample size and a visually balanced sample. 60 stitches were required for the cast on. The pattern details the lace repeat both written (worked in the round) and as a chart. We chose working with the chart as the visual aid was convenient when working the swatch flat. We used stitch markers to define the beginning and end of each lace repeat. As 3.25mm was the needle size suggested in the pattern, we thought this would be a good starting point to explore gauge. Our swatch will be knit flat as noted above. Please note the Tegna pattern, as written, is worked in the round. 60 stitches were cast on using the long-tail method. The lace repeat was worked flat until the end of the chart. Approximately 10cm (4'') was knit in stocking stitch to complete the swatch. The live stitches were secured by simply threading the yarn tail through the loops using a tapestry needle. The swatch was soaked in a bath of cool water for around 5 minutes, the excess water pressed out using a towel. The swatch was then pinned out on a blocking matt, attention given to opening up the lacework and aligning the stiches that frame the lace detail. Though, it’s important to note that we worked the swatch flat. Working in the round could produce a slightly different row gauge. Based on these results we’d go ahead and knit the garment on 3.25mm needles, monitoring row gauge and adjusting the body length in the stocking stitch section if necessary. At this airy gauge, Cotton Fine has produced a soft drapey fabric with a smooth hand-feel. The cotton/merino blend offers great stitch definition, the detail in the lace panel is clear and structural elements well defined. The resulting texture is feminine and cool. The lacework was intuitive and the pattern easy to follow. Using stitch markers definitely helped us track the lace repeats and catch those missed yarnovers! Cotton Fine worked up nicely and we think it has great potential for light-weight knitted garments. Tegna is an exciting introduction to both lacework and knitted garment construction and is highly recommended to anyone motivated to give it a try. TEGNA BY CAITLIN HUNTER CAN BE FOUND ON RAVELRY. Introducing Cotton Fine by Brown Sheep Co.
With the recent introduction of Cotton Fine to the Loom & Spindle yarn range, we’ve been excited to explore our new yarn. Our first swatch is a woven sampler in plain-weave, woven at a sett of 40ends/10cm (10epi) on a rigid heddle loom. Our aim was to explore the fabric’s hand-feel, interaction of colour and the effect of using a finishing technique to full the fabric and set the fibres. We’ve detailed the project below to offer insight into our planning and methodology, and our thoughts on the resulting fabric. This recipe is a great starting point if you want to have a go at swatching for your next weaving project! A woven sampler in plain-weave, woven at 40ends/10cm (10epi), using Cotton Fine By Brown Sheep Co. The effect of using a finishing technique to full the fabric / set the fibre. As the materials and tools were pre-established, planning was limited to determining an appropriate size for the sample, approximating the metreage required, and defining colour placement. It was determined that a sample size of 30cm x 45cm (12"x 18") would be sufficient to examine hand-feel, colour interaction and allow for any shrinkage that may occur during finishing. The placement of colour was kept simple, the three colours being divided in blocks evenly across both warp and weft. These calculations tell us that at 196m per skein, one ball of Cotton Fine would be enough to make a sample of this size. As the plan was to use three colours in equal quantities in this piece, we divided the total metreage by three to determine the amount for each colour, 180m divided by 3 = 60m per colour. The rigid heddle loom was warped and colours placed as per the planning notes. 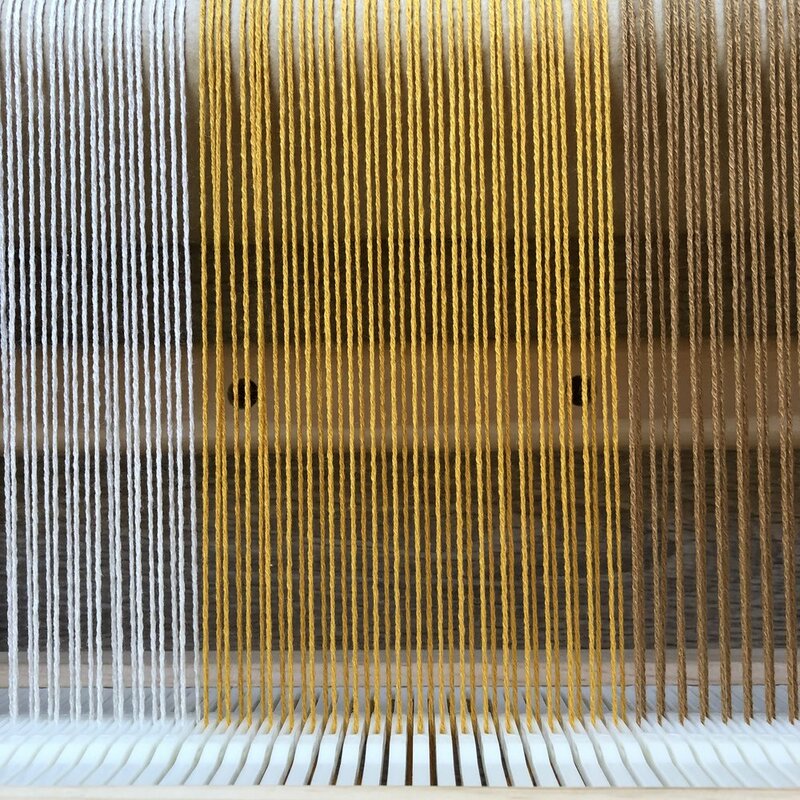 3cm of ground weave was woven with leftover Cotton Fine to help evenly space and tension the warp. Weaving began using the first colour in the sequence,. Once the fabric was established, a row of hem-stitch was used to secure warp and weft at the beginning of the piece. Weaving continued, changing colours as required until each colour section was completed. Once complete, a row of hem-stitch was used to secure warp and weft before cutting the piece from the loom. The sample was finished by undergoing a full wash cycle in a washing machine and dried in a tumble dryer using a regular heat setting. This treatment contradicts the recommended care instructions for Cotton Fine, but we thought this experiment was warranted to help set the weave and allow the fibres to bloom. The resulting fabric has a great lightness and after finishing is quite soft to the touch. At this sett, the fabric feels smooth and has excellent drape. Though it’s not a firm weave, the fabric feels like it would be somewhat hard-wearing and have some longevity when used in pieces that will see some wear-and-tear. The effect of the bold colour blocking produces a homey fabric and in the chosen colour palette has a somewhat vintage feel. Working with three colours allows for endless permutations that can be used to influence the look and feel of the fabric. From our results we think the fabric would be best suited to household napery and table linens. The drape suggests that with a bit of fine tuning there is scope to work the fabric into garments, maybe simple summer tees and tunics. We would like to experiment next by working the yarn up at a finer gauge with the aim of creating a denser fabric that could be used for towelling applications in the home – washcloths, tea towels, etc. To learn more about Cotton Fine please click HERE. We’re proud to introduce the latest line-up in the Loom & Spindle Yarn + Fibre range - Cotton Fine by Brown Sheep Co.. This sumptuous blend of pima cotton and merino wool delivers a light and resilient yarn ideal for summer wardrobe staples and textiles for the home. Two samples in cotton fine.